According to discogs.com, this album was recorded on February 14, 1956 in San Francisco, CA with Desmond on alto sax, Norman Bates on bass, and Joe Dodge on drums. It has been re-released on audio CD and as an MP3 download. 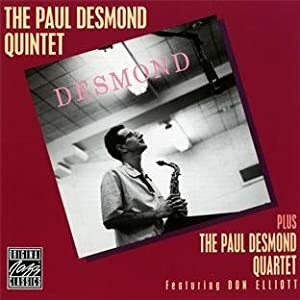 The newer releases also contain tracks of the Desmond Quintet without Elliott. These tracks were already on YouTube. I did not upload them, and I am not hosting their content on my website. The first track, "Jazzabelle", written by Desmond, features a great mellophone solo. Like much of the album, it is cool and upbeat. The second track, "A Watchman's Carol", written by Don Elliott, is slightly slower, and it also has an excellent mellophone solo. The third track, "Everything Happens to Me", is a cool ballad with another excellent mellophone solo. The fourth track, "Let's Get Away From It All", is upbeat and features Don Elliott on trumpet. The fifth track, "Look for the Silver Lining" is an upbeat mellophone feature with a great solo that is transcribed here: http://www.jazzcapacitor.com/pdf/silverliningelliott.pdf. I have transposed this to treble clef for F instruments and will upload it soon. There are also some great recordings of Chet Baker playing and singing "Look for the Silver Lining" on YouTube. The sixth track, "Sacre Blues", is in a style different from the other tracks. It is a slow blues. Don does not play on the first head, but he has a great mellophone solo later, which he builds up extremely well, and he plays on the second head. The seventh track, "You Go to My Head", features Elliott on trumpet. The eighth track, Line for Lyons, has an upbeat melody with intertwining mellophone and saxophone lines and another great mellophone solo.